After a career in the financial services industry working for the National Australia Bank, Jude Newton decided to embark on the MBA at Melbourne Business School—ranked among the top MBA programs in the world by the Financial Times. While there, he co-founded the non-profit company called Third Man Up, which runs social and sporting events to raise funds for existing charities. They focus on those who are passionate about supporting the health, development, and well-being of young people in Australia. 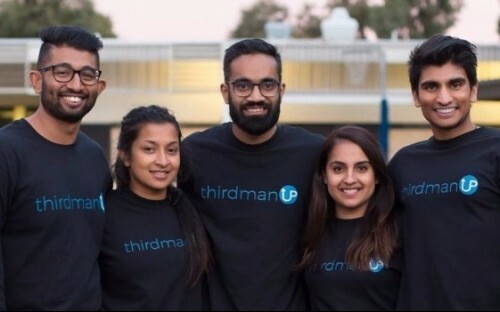 Third Man Up was founded by Jude and four friends, Srinath Susarla, Suri Samsoodeen, Rishi Kher and Natasha Arora. All five had experiences in organizing events for university clubs or charities, and by pulling together they are making a real difference in the local community. “Most definitely,” he beams, when asked whether more MBAs should launch careers within the non-profit sector. “A lot of charities that we have come across currently rely too heavily on government grants, which makes forecasting and planning difficult,” Jude explains. In 2017, they raised over $12,000 (AUD) for four different charities—Helping Hoops, the Father Bob Maguire Foundation, Ladder Foundation, and Wavecare Counselling Services. Leadership was the first subject he completed, he says, which gave him a solid understanding in how to maneuver a variety of personalities and cultures, developing a well-polished business team—the Melbourne Business School class of 2017 is made up of 23 nationalities, immersing students in a global classroom. Among them, marketing professor Don O’Sullivan who Jude cites as key to his development as an entrepreneur. The case studies taught to him during the Business Strategy module—led by Geoff Lewis—have also educated him on the best methods with which to develop the company. In Australia, he says, there is an “oversaturation” of not-for-profits and charities. He adds that this means Third Man Up supports charities who operate on a smaller scale, so they know the impact of every dollar they donate. There is a perception that the money donated doesn’t always feed directly to those who need it most—instead, there is a proportion of the funds being spent on “administration costs”, Jude says. After graduating, Jude says there are a wealth of leadership opportunities available for students in Melbourne. “For any job I’ve applied for, merely mentioning my experiences of doing an MBA at Melbourne Business School has put me in a strong position for the application process,” he adds. For Jude, the Melbourne MBA is a holistic package of everything an MBA program should be. “Melbourne has been voted the most livable city in the world for many years and it’s no secret why,” he concludes.